In this showcase of Alan Cotton's paintings from a recent London exhibition, the reader is taken from the searing yellows and crimsons of the Mediterranean to the cool greens and blues of Ireland, from the sun bleached square in Marrakech at midday to the early morning interior of the Venice Fish Market. Each painting is distinctively a "Cotton", yet variation and contrast give each one its own identity — what the artist calls "a sense of place". Throughout every aspect of my life, I have a need for contrasts, and this is certainly true when it comes to my work. With each new location, a fresh approach is needed. My response to the material is usually interpreted through drawing. I travel light with pens, drawing book and watercolours, which gives me tremendous freedom to wander unencumbered and enables me to fill my head, as well as my books, with ideas. When I come to work in the studio I decide whether the overall ambience of the painting will be warm or cool. For those Mediterranean or North African climes I will colour wash the canvases in Yellow Ochre or Madder Brown before starting to work on the painting. For cooler climes, where blues and greens dominate, I will start on a bluish tinged base. The colours on the palette, the size of the canvas, the shape of the knife I use, the quality of the mark I make, will all change as I begin to interpret a new place in paint. Always I feel the need to move on and find new places to paint, yet I can never resist returning to my old haunts. Each time I move on, my approach to the painting changes and new sets of problems must be overcome. I work literally on a knife-edge, exploring new techniques, keeping the work forever vibrant and, hopefully, giving each painting its own identity. Hartland Quay, Early Morning - sketch When I first came down the hill into Hartland Quay, in North Devon, and stood at the cliff edge looking along the coast, the sheer drama was mind-blowing. It was a stormy day, and as I watched the energy of that great solid mass of water constantly hitting the rugged coastline I knew that this subject would make large, dynamic paintings. 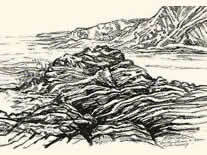 The drawings themselves were vigorous, but whilst recording the shapes and distances and noting the impact of the waves, there was no way that a pen could indicate the sheer power of that landscape. Only when I was back in my studio could I begin to convey the pure excitement and drama of my experience. To transfer the images from my drawing book I used diluted Prussian Blue oil paint. I worked feverishly to complete the underpainting and then, taking a large painting knife, used my muscles to attack it with paint, dragging great masses of pigment across four feet of canvas. Once the vast slats of rock were in place I left it to allow the paint to begin to form a skin. Hard, impasto ridges left by the edge of the knife provided the texture I needed to bring the waves crashing in. Working with a knife loaded with Titanium White pigment, I scumbled the paint over the hardened edges of the rocks, so that the dark outlines could be seen through the white spray of the incoming tide. Every painting I made of Hartland was an attempt to look at the relationship between the static land strata and the movement of the water coming in, constantly trying to erode it. Always one is aware of the harshness of the environment, of shipwrecks and lost lives. In some areas, certainly in the darks, I began to scrape back to the surface so that the white of the canvas or the underlying colours would show through giving a translucency that I couldn't achieve simply with opaque pigment. 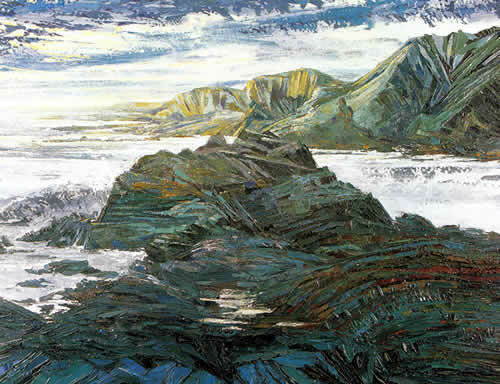 One of the best painting places I've experienced is the West Coast of Ireland. I think it is one of the most unspoilt and one of the most romantic parts of Europe. It took me many years visiting Ireland before I could begin to paint it. I needed to understand something of the culture. I wanted to get under the skin of the way people live, and how they try to scrape out a living from the soil in a very hostile landscape. I read the history and all the deprivations of the 19th century and it touched me very deeply. 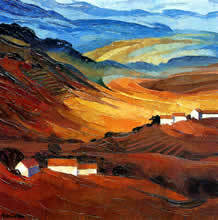 To see in the landscape the traces of such history is an important part of what I try to say in my paintings. changes and a new set of problems must be overcome." It isn't enough just to go to an area and set up an easel. It is important to talk to people, get to know them, get into the pubs and listen to the music. Gradually, this helped me to gain a deeper knowledge of the landscape and the way people helped to shape it. Stone walls divide the fields and form small enclosures with paths and tracks meandering around them. Always there are remains of a past hard life. Often the old stonewalls are broken down and new cottages stand beside derelict dwellings. Light is the vital ingredient, but sometimes there is nothing to inspire. It's misty, it's raining or drizzly and you just want to be in the nearest pub. Then the clouds move away and magnificent streaks of sunlight illuminate the landscape, creating fantastic areas of light and shade. Unlike places like Provence, where I can take my time, here in Ireland I must work quickly, chasing the bursts of sun before the storm clouds break. Many of my Irish drawings are splattered with rain. In Provence when I am trying to interpret the wide panoramas of the Luberon, the horizon is high and often there is no horizon at all. 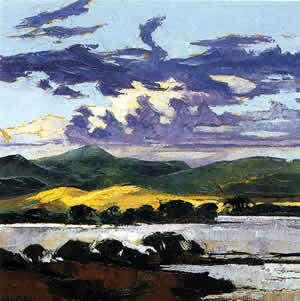 On the West Coast of Ireland, however, the sky and clouds dominate the paintings. 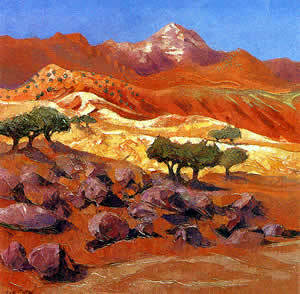 The drama of light and shade is more pronounced than in any other landscape I have painted. My love affair with Provence began when I was still a student, searching for the locations of my heroes, Van Gogh and Cezanne. Yet it was neither at Aries, St Remy nor on the slopes of St Victoire that I found my own area of Provence. It was the region of the Vaucluse and the Luberon that stirred my soul. The contrast with Hartland could not have been greater. Provence is all about the good life. It's the most sensuous region to paint. Here there is time to meet the people, enjoy a glass of wine and sit in the fields to draw with the sun on my back. As well as drawing, I often make colour studies in watercolour or pastel. In the studio, these drawings and studies remind me so much of the place, not just the visual sensations, but also the circumstances in which I did them; the scents and sounds, the warmth of the sun, the potency of the colours. Therefore, the process of painting is done not only by mixing the colours on the palette, but also with the aid of the memories evoked by my drawings. I remember the very first time I saw Gordes. I approached it from the south in evening light and was just stunned by the image. That one moment has never left me. It was an amazing experience being in the High Atlas — the scale, the remoteness and above all the colour. What deeply impressed me was seeing sequences of colour that I'd never seen before. These were colours that were essentially earth colours, but such a subtle range. I spent a good deal of time in the Atlas Mountains in evening light, where you do get extraordinarily brilliant peaks in the distance or middle distance. They have an almost golden glow in the evening light. Then in the valleys nearer to you, it's very dark but the remarkable thing is that even within the darks there is an enormous amount of colour. There is not only reflected light, but deep passages of purples and essentially warm colours, verging on crimson. The contrast between these deeper colours in shadow in the near distance and the brilliance of the mountains in the middle or far distance create an extraordinary contrast which is very dramatic. When I came back from Morocco I was armed with many drawings and some small colour studies I'd made. I'd actually phoned ahead to England to order different paint colours that I hadn't used for many years, such as Light Red, Indian Red, Raw Sienna, Van Dyke Brown and Carmine to give me a wider range of earth colours. I started to use oil paint on a white canvas, almost like watercolour, where I would lay down certain pieces of colour like underpainting and then make brush drawings. Then in some areas, certainly in the darks, I began to scrape back to the surface so that the white of the canvas or the underlying colours would show through and a give a translucency that I couldn't achieve simply with opaque pigment. Nevertheless, certain passages of the painting were done using very impasto paint and I think the combination of thin to thick gives vibrancy to the work. Dealing with colours — particularly the purples, madder, browns and umbers that have a vitality all of their own — was quite a challenge. The way I was able to achieve these colour sequences was by getting a thinness of paint and building up as needed. It was these combinations of techniques that enabled me to produce what I think are a vibrant group of paintings.